ETS-Lindgren’s Model 5225 WLAN Access Point Testing System is a self-contained portable enclosure that allows the operator to conduit Over-The-Air (OTA) testing of an Access Points’ transmit and receive functionality of an Access Point and its throughput performance. The system uses a specially designed, circularly polarized micro strip patch antenna in the enclosure to interface with an Access Points’ RF antenna(s). The coupling coefficient has a flat response over the 802.11/b frequency range of 2.2 GHz to 2.6 GHz devices, and over the 802.11/a/g frequency range of 5.2 GHz to 6.0 GHz. 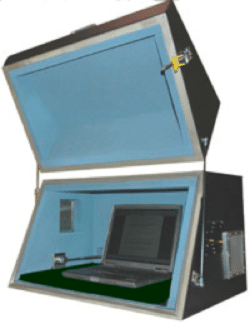 Using this shielded OTA interface test enclosure, the operator performs the test faster and simulates the real-world operational environment. The OTA test method provides a shorter signal path and readily detects a faulty antenna. The direct connection method bypasses the antenna and adds up to several dB of loss to the measurement. However, a connector is provided for direct cable connection, if desired. Since polarization sensitivity is an important design parameter for WLAN interface devices, a circularly polarized micro-strip patch antenna is provided to transmit and receive RF signal for two orthogonal polarizations. The patch antenna can be accessed through a 50 ohm SMA connector port.